I don't think you're ready because it's watermelon and Campari flavoured. 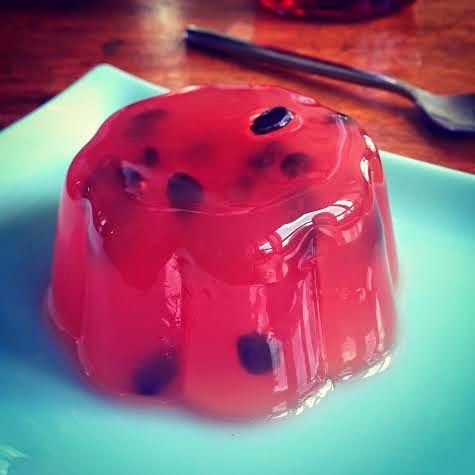 I love the freshness of jelly, and there's no cleaner, fresher flavour than watermelon. How do you juice a watermelon I hear you ask? You don't. You buy juice. Rubicon do it. As the joy of jelly is as much about how it looks as how it tastes, suspending the seeds from a real watermelon makes it a real show-stopper. Campari reminds me of holidays in Italy, and its redness and slight bitterness make this a jelly for grown-ups. I know not everyone feels the same, so if it's not your thing, just leave it out. Watermelon seeds, I cut mine out of a fresh watermelon— these aren't strictly necessary, but they look great. Submerge the gelatine leaves in cold water for them to soak. Pour the watermelon juice, lime juice, sugar and Campari into a saucepan and gently bring to the boil. If you don't like Campari, just leave it out. Remove the gelatine leaves from the water — squeeze out the excess. Stir them into the hot liquid, making sure they're fully dissolved. Pour into your mould or glasses and fridge them for about 4 hours. If you're adding them watermelon seeds, just stir them into the jelly once it's started to set - about 45 mins after it's been in the fridge. Dip the mould in hot water before turning it out. This is so clever Alice - and it looks beautiful!